Want to avoid extra housework? Looking for a sleek, smart style? Window coverings like blinds and curtains are a dust magnet. They can even hold fungal spores and bacteria build-up in the worst cases. Trying to clean your blinds often provides its own source of frustration, thankfully, there is a solution. 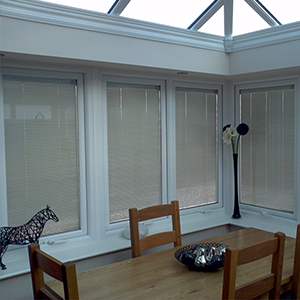 Integral blinds are available to go in all window and door glass sealed units. These blinds are in between the 2 panes of the sealed unit, eliminating the need for awkward cleaning. This creates a neat, chic style for your conservatory and allows much more precise control over the amount of light and heat that you let into your conservatory or building. We also have a range of colours in our integral blinds so you can get just the style you are looking for. Please give our team a call on 01279 813888 and we will arrange a time to show you the type integral blind that will transform your conservatory.